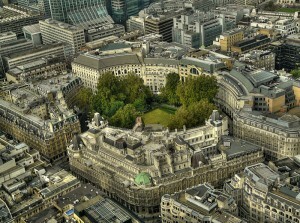 City of London has a large selection of landmarks and notable buildings, but it does not include any sizeable parks. However, it is home to various small open spaces and gardens. In the Square Mile you can find artwork and water features in the pedestrianized lanes and the courtyards, beautiful churchyards like the St. Olave Hart Street churchyard and formal gardens. The most famous and beautiful garden is the Finsbury Circus. It covers 2.2 hectares of land and it represents the City’s biggest public open space. The place is called the “circus” because it has an elliptical shape, resembling the Roman circus venues. The centre of the garden accommodates the Lawn Bowls Club, established in 1925. Close to the club, you’ll see a bandstand dating from 1955. The circus was initially founded in 1812 and it was incorporated in the Finsbury Manor. The houses were finally demolished in the early 20th century leaving room for the gardens with their beautiful lime trees. The area became a public park in the beginning of the 20th century. Finsbury Park sits on the Coleman Street and it’s situated nearby the Liverpool Street Station and the Moorgate Tube Station. Another remarkable park that is part of City of London is Postman’s Park. It is situated very close to St. Paul’s Cathedral and it’s surrounded by the GPO (General Post Office) head office, King Edward Street, Aldersgate Street and Little Britain. The park was founded in 1880 and it replaced the burial ground and the churchyard in the Church of St Botolph’s Aldersgate. Its key features are the Watts monument, the Memorial to Heroic Self Sacrifice and the ceramic memorial tablets situated on a long wall. All these elements are listed as Grade II structures. Other impressive gardens that you can visit in the City of London are the Whittington Gardens, Barber-Surgeon’s Hall Garden, West Smithfield Garden, Cleary Garden, St. Paul’s churchyard, Jubilee Garden, St Mary Aldermanbury and Seething Lane Garden. In order to get rail transport from London Gatwick Airport to City of London, you have to take the train to London Victoria. There are also other transfer options such as using a transfer service from Gatwick Airport to City of London. So as to travel by car from London Gatwick Airport to City of London, you must take the A23 and M23. London Gatwick Airport is 28.1 miles away from City of London. A journey by transfer from London Gatwick Airport to City of London with 247 Gatwick Airport Transfer is going to last around 1 hour and 25 minutes. The price for a taxi service from London Gatwick Airport to City of London starts from 58 GBP.